In 2015 Comet Bay College introduced REACH (Resilience, Emotional Awareness, Careers and Health) in Years 7, 8 and 9. REACH is a pastoral care curriculum delivering quality social and emotional learning (SEL) programs in a classroom environment. Extensive worldwide research highlights the need to develop students social and emotional skills. The need for SEL is summarised well by Hartup, ‘The single best childhood predictor of adult adaptation is not school grades, and not classroom behaviour, but rather, the adequacy with which the child gets along with other children. Children who are generally disliked, who are aggressive and disruptive, who are unable to sustain close relationships with other children, and who cannot establish a place for themselves in the peer culture are seriously at risk’ (Hartup, 1992, p.1). Social and emotional well-being refers to the achievement of expected development milestones and the establishment of effective coping skills secure attachments, and positive social relationships. Social and Emotional Learning (SEL) is defined as, “ the process through which we learn to recognise and manage emotions, care about others, make good decisions, behave ethically and responsibly, develop positive relationships, and avoid negative behaviours” . Students with social and emotional distress will display internalising behaviours (anxiety, depression) and externalising behaviours (aggressive, violent, disruptive, bullying behaviours), and this has an impact on the child’s successful learning at school. The Melbourne Declaration on the Educational Goals of Young Australians recognises Social and Emotional Learning (SEL) in schools assists students to become successful learners, helping to improve their academic learning and enhancing their motivation to reach their full potential. “Without social and emotional skills children cannot learn as effectively and cannot make the most of their learning. A child who is afraid in the classroom or in the schoolyard or bringing fears from home cannot concentrate on learning. A child who has not learned to consider others cannot use what they learn to make effective negotiations in the real world” (Social and Emotional Learning as a Basis for Curriculum, 2014). When given 12 topical issues including alcohol, body image, bullying/emotional abuse, coping with stress, depression, discrimination, drugs, family conflict, gambling, personal safety, school or study problems and suicide. The top three concerns were of youth were; coping with stress; school or study problems and body image. PSC is defined as “a range of practices to develop students’ personal/emotional and social/relational dispositions, intelligences, sensibilities and learning state. The range includes recognising and regulating emotions, developing empathy for others and understanding relationships, establishing and building positive relationships, making responsible decisions, working effectively in teams, handling challenging situations constructively and developing leadership skills” . The two terms SEL and PSC are interchangeable. SEL is used by The Collaborative or Academic, Social, and Emotional Learning (CASEL) which is the leading organisation in understandings, research, networks and curriculum school practice in personal and social learning. Most educational programs around the world that integrate social and emotional learning are based on CASEL’s SEL framework. Australian Curriculum Assessment and Reporting Authority (ACARA) are based on CASEL’s SEL framework, however, ACARA use the term PSC in regards to their General Capabilities. Successful practises in Pastoral Care are based on The Model for Effective Practise in Schools, which puts an emphasis on the need for providing pastoral care at different levels in schools. Support is needed to the general whole school as much as targeted groups and individual case work. The SEL programs delivered in REACH are evidence effective, cognitive strength based programs, targeted to meet the students’ current needs. The curriculum has flexibility to accommodate any changes in the student’s needs. Listed below are Young Australians issues of personal concern and the evidence based SEL or PSCH programs implemented in addressing the issues. 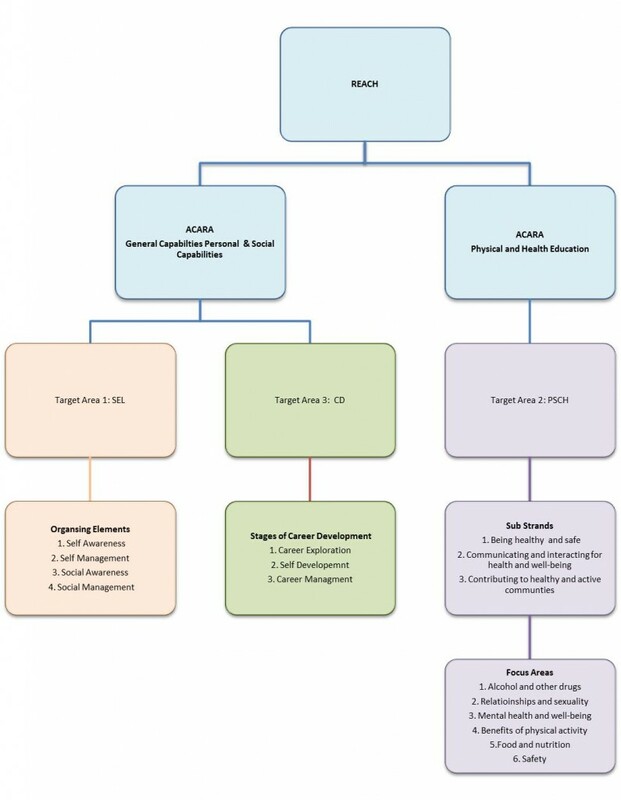 All planning and assessments are based and link to the ACARA GCPSC and organised into the four interrelated and non-sequential elements; self-awareness, self-management, social awareness and social management. • A sense of internal motivation, and have a sense of satisfaction when goals are attained. This skill relates to an individual’s perception of his or her own ability to accomplish a goal or execute a plan and has been shown to shape long-term aspirations and career trajectories. • Emotion regulation which involves learning to manage feeling overwhelmed and to adopt strategies that help re-establish a state of balance after feeling overwhelmed. This aspect is particularly important as students experience more challenging coursework in high school and have to handle emotions such as test anxiety. • Students who can cope with stress have been found to transition more successfully and perform better academically. Social awareness is the ability to perceive and understand other peoples’ emotions and viewpoints, show understanding and empathy for others, identify the strengths of team members, define and accept individual and group roles and responsibilities, be of service to others, and recognise and use family, school, and community resources. In developing and acting with personal and social capacity, students demonstrate: Ability to understand and respect others’ perspectives in social interactions. This ability has direct implications both for the development of healthy interpersonal relationships and for moral and prosocial behaviour. • Ability to identify situations in which social support can serve as a resource for managing problems. For example, parental and peer support during the transition to secondary schooling is important in lowering anxiety levels and helping students to meet the academic demands. Relationship skills include establishing and maintaining healthy and rewarding relationships based on cooperation; resisting inappropriate social pressure; preventing, managing, and resolving interpersonal conflict; and seeking help when needed. PSCH is a strand from Australian Curriculum Health and Physical Education Syllabus. PSCH PSCH is organised into three sub strands and six focus areas supporting students to make decisions about their own health, safety and wellbeing. The content develops the knowledge, understanding and skills to support students to be resilient, and enables them to access and understand health information and empowers them to make healthy, safe and active choices. Career development in schools provides young people with the tools they need to make informed career decisions and transitions from secondary schools throughout their lives. It helps students prepare for their future through the acquisition of skills, knowledge and competencies required to self-manage their own careers. It focuses young people’s attention on recognizing or creating opportunities, making informed choices and defining and achieving their career goals. The REACH Program aligns with the Department of Education and Early Childhood Development (DEECD) Victorian Careers Framework and Careers and Transition Resource Kit. This framework is based on the National Partnership on Youth Attainment and Transitions and Australian Blueprint for Career Development eleven core competencies. • Apply their skills and knowledge to their learning and career planning. • Develop and update an annual Career Action Plan that reflects their increased learning, builds on previous planning and identifies future actions.